Why Remove a Perfectly Good Sign?!? Instead, Use these OVERLAYS to change the violation AMOUNT! They are QUICK and EASY to apply, and are GUARANTEED to last as long as the sign itself. 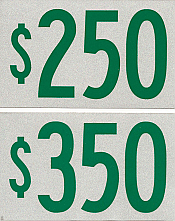 In 2006, the state of Illinois changed the violation amount for Handicap Parking Stalls from $100.00 to a minimum of $250.00. Since then a number of jurisdictions have changed their violation amounts by ordinance to $350.00 (Chicago; Peoria; Roscoe and Willowbrook to name a few). In most jurisdictions, there are fines for business & property owners who do not comply with these updates. Why risk it, when we have a LOW COST, SIMPLE SOLUTION for you! These overlays are SILK SCREENED onto 3M ENGINEER GRADE vinyl material with self adhesive backing. Available in either $250 or $350 denominations.